The Bognor Regis branch of Covers Timber and Builders Merchants will be supporting the Pagham Pram Race 2018 as a corporate sponsor for its third consecutive year. Pagham’s traditional Boxing Day pram push – the oldest in the world – spans back more than 70 years and regularly welcomes visitors from all over the world in an effort to raise funds for local causes. 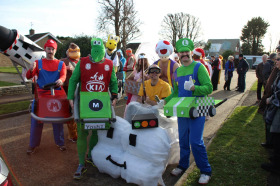 The three-mile route, which sees teams in fancy dress pushing decorated prams around a race course, starts at the Mill on Pagham Road and finishes at The Lamb pub car park, passing other local pubs along the way. The Pagham Pram Race takes place at 11am on Boxing Day. Full details about the event, including how to take part, are available at www.paghamprace.com .